Forensic science major Amanda Mills discusses crime scene photography with students from Boyce Middle School. 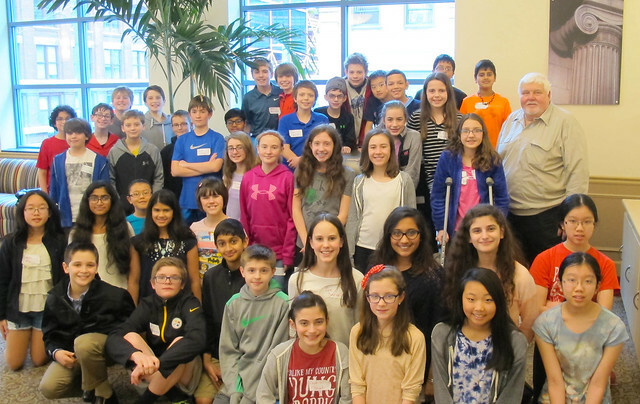 Forty-two gifted education students from Upper St. Clair School District's Boyce Middle School visited Point Park's CSI House March 10, engaging in hands-on crime scene work and a fiber analysis lab while learning about the forensic science field. Gifted Coordinator Diane Ecker, whose current curriculum is mystery-themed, knew Point Park had a CSI house on campus. After talking with Assistant Professor of Forensic Science Edward Strimlan, M.D., she decided it was the perfect place to take her students. "Dr. Strimlan is such a knowledgeable and accomplished man. He was quite accommodating and tailored our day accordingly," explained Ecker. In addition to Dr. Strimlan, Point Park forensic science majors Madeleine Adams, Leanna Brooks, Sarah Lukaszewicz, Amanda Mills, Alex Pochiba and Thomas Roberts worked with the middle school students in the lab and CSI house. "This was a cool opportunity to teach kids about how forensic science works compared to what they see on TV," said Brooks, a junior forensic science and biology double major and member of the Forensic Science Club. Roberts, a sophomore forensic science major, added: "I thought it was important to help out and show the students that males are in this profession, too. I also wanted to pass along knowledge about the forensic science field to this next generation." "Point Park's forensic science students were informed and excited to teach and share. They are truly committed to this program and profession," said Ecker. "I was very impressed with this intelligent, well-behaved group. They participated so well," remarked Strimlan. "My students couldn't stop talking about this memorable, hands-on experience. I have no doubt you will see many of them back at Point Park for the CSI high school summer camp," said Ecker.